i Click 'view all' to instantly compare this good deal with offers on other top range hoods. 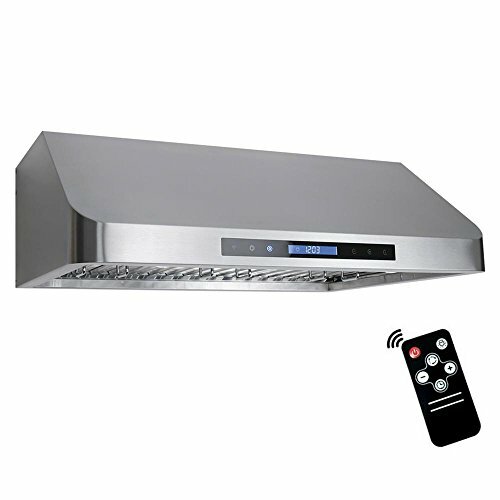 Cosmo COS-QS75 Pro-Style Under Cabinet Range Hood is currently selling at $240.99, approximately $5.17 lower than average, giving a potential saving of $80.00 right now. With a lowest price of $238.19 and an average of $246.16 it is selling on the low end of its usual range. Price volatility is 1.34% (meaning it does not change often), so the price should stay low for a while. Right now this product is a recommended 'good deal'. Compare the current price, savings (in dollars & percent) and Buy Ratings for the top Range Hoods that are closely related to Cosmo COS-QS75 Pro-Style Under Cabinet Range Hood. Here is how Cosmo COS-QS75 Pro-Style Under Cabinet Range Hood compares with other leading Range Hoods. Cosmo presents this professional style under cabinet range hood made for all the challenges in the kitchen. Brushed stainless steel is used for the body and permanent filters. Easy use touch controls operate the 3-speed fan, 900 CFM of suction, and auto-delay shut off timer. Energy efficient LED light keeps your cooking area lit for cooking at night. Step away to anywhere in the kitchen with the included remote control for added convenience. For professional results, trust a name like Cosmo for your next kitchen appliance. FeaturesPOWERFUL YET QUIET: 900 CFM with backlit touchscreen, 3 speed, Twin Centrifugal Motors. Cosmo's undercabinet range-hood quickly ventilates your kitchen without the loudness and sounds of competing range hoods.EASY TO CLEAN FILTERS: Arc Flow permanent filters are dishwasher-safe and extremely durable. No need to replace these filters, simply drop them in the dishwasher for easy maintenance and cost savings.POWERFUL ENERGY EFFICIENT LIGHTS: The energy efficient, 1.5-watt LEDs are long lasting and provide Bright high lumen LED lighting for better visibility at nightCONTEMPORARY MODERN DESIGN: Commercial pro-style canopy rangehood is both elegant and powerful adding sophistication to your kitchen. Made of premium 430 grade, 20-Gauge thickness stainless steel.